Alexandre Pato to finally get his chance? - Don't count on him starting! Is it just me or is anyone else becoming increasingly frustrated with Guus Hiddink? After his comments yesterday about experimentation between now and the end of the season, he STILL would not confirm that Pato will start! Diego Costa is suspended, Loic Remy is useless and Bertrand Traore can play out wide so why not give Pato a start? I have been banging on about it for the past few weeks because I want to see players with a real hunger to play and to impress. It's such an important time now, we have to ensure that we approach the final eight games in the right way and not to just play the game until our nightmare season fizzles out. "We have now eight games coming up, but there isn’t much to play for so it might be time for experiments." I don't buy that at all and I expect Hiddink to play the same players as usual to start the game with maybe one change (Traore in for Remy) this afternoon. If you say you are going to do it, then have the balls to do it and play those players itching for a game such as Baba Rahman, Matt Miazga, Ruben Loftus-Cheek, Asmir Begovic, Nemanja Matic and Alexandre Pato! We have a tendency in this country to write people off quickly and the situation and coverage of Pato is a prime example. However, if you look at the facts, he was outstanding in Milan for a few seasons at such a young age until injury plagued him for two seasons. He went back to Brazil, got himself match fit and has continued his impressive form and was scoring goals again. Why has he been written off now? OK, I understand we could have another potential Falcao situation with him not being able to find the form that turned him into one of the hottest properties in Europe over the last two seasons, but that's down to injury and not being given a run of games. Alexandre Pato could turn out to be a shadow of his former self and Chelsea are faced with a Double Bubble loan signing that turns into a complete waste of time - I do understand that, but I refuse to write him off before he is even given a chance! This afternoon is the perfect opportunity to give him a game and to see what happens. We have nothing to lose now and with Villa suffering the way they have in the League and in turmoil over the mess that was the Remi Garde appointment, Chelsea need to take advantage with an experimental side that contains players hungry for a game. 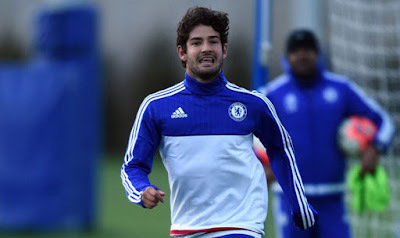 There is a saying in Football: "Form in temporary, class is permanent" - Give Alexandre Pato the start!! !